Vail’s largest commercial developer. An owner of a car-detail shop. A former nonprofit event planner. A businessman who made a fortune in child car seats. A one-time Subway franchisee bankrupted by real estate losses. 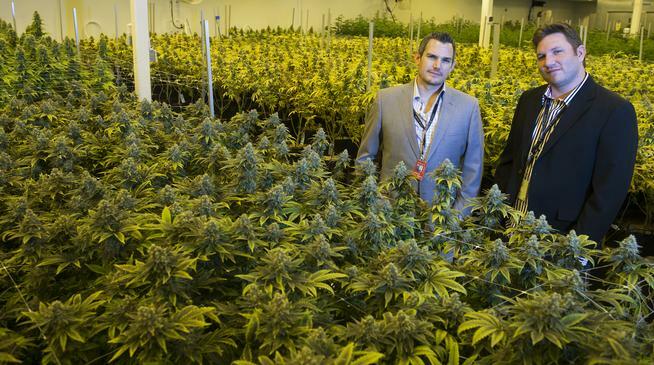 These marijuana business entrepreneurs — Peter Knobel, Joshua Ginsberg, Rhett Jordan, John Lord and John Fritzel — have emerged atop Denver’s pot industry just two years after the first recreational joint was sold. 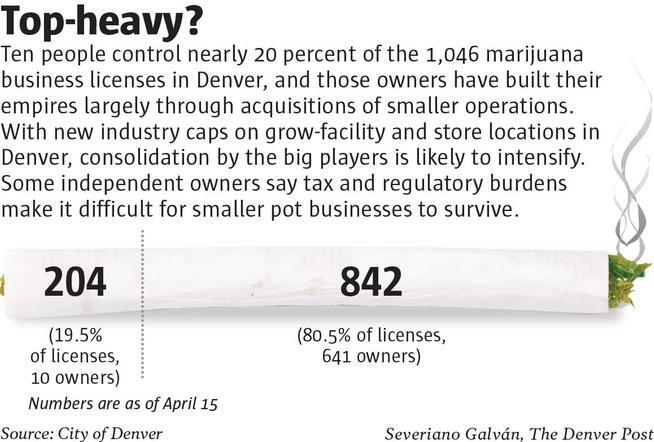 In all, they hold 134 marijuana business licenses in Denver — about 13 percent of the total. An analysis of marijuana license data in Denver, which accounts for about 44 percent of licenses statewide, reveals for the first time who is behind the pot industry and how the market ownership has evolved since January 2014. The Denver Post identified the biggest players as those holding the most licenses as of April 15 in Denver — because comparable statewide information is difficult to obtain. The Post found that 10 people control nearly 20 percent of Denver’s 1,046 active medical and recreational licenses. They have cornered the top of the city’s pot market largely by acquiring smaller grows, shops, dispensaries and infused product makers. But the numbers tell a story of a consolidating industry, as big operators buy small ones struggling to keep up with more government regulations, tax rules and other pressures. With no limit to the number of licenses any one person or company can control, and new city-set caps recently approved to limit store and grow-facility locations, the city’s marijuana trade looks ripe for the big players to dominate even more. Although several people stood out as likely candidates to be atop the recreational industry when sales began — those who already held medical marijuana licenses and were the only ones allowed to obtain recreational ones — that has happened only in part. Among the top 10 owners, just three led the list of medical marijuana business owners in the state in 2013 before recreational weed became legal here. Of the top five, only Lord was a factor in the medical marijuana sector when retail sales began. Today he sits atop its leaders with 14 retail licenses. He still holds the oldest marijuana license issued by the city, in 2010. About $330 million of medical marijuana was sold in Colorado in 2013, and that grew to $408 million in 2015. But the real growth has been in retail sales, which exploded from zero in 2013 to $588 million last year, bringing the total marijuana market to just under $1 billion, state figures show. Of the city’s licenses, about two-thirds are medical and one-third are recreational. One of the reasons there remain so many more licenses for medical marijuana compared with recreational is that medical operations generally are smaller. Among Native Roots’ Denver licenses, 50 are medical and nine are recreational. Knobel is the controlling partner with 50 percent. Ginsberg and Jordan each hold a quarter, city license records show. Native Roots has operations in Denver, Aspen and Edwards. Lord is sole owner of the LivWell business that holds 43 licenses in Denver and has operations in Colorado Springs, Trinidad, Garden City and the state’s southwest corner. Lord owned the most medical marijuana dispensaries in Colorado when recreational sales began — seven — and at the time appeared likely to build the largest retail presence. The number of grow licenses often outpaces the number of shops and dispensaries because of the limit on the number of marijuana plants that can be cultivated under each. The more prolific the retail or medical shops, the greater the need for additional grow licenses. Fritzel holds sole or controlling interests in four enterprises — Buddy Boy, Lightshade, PotCo and MJardin — which have 32 licenses in Denver, and the principals also have a presence in other states. Between them, the top five employ about 2,000 people, enough to put them into the top 12 private employers in the city. While the five will not openly discuss their finances, their revenues each reach about $100 million annually. One is confident enough to speculate that his operations across several states will top $250 million in annual revenues within the next two years. Close behind the top five in terms of license numbers are partners Matthew Aiken, Christian Johnson and Anthony Sauro, whose Sweet Leaf enterprise holds 27 city pot licenses, followed by Shawn Phillips — The Sanctuary, The Grove, The Haven, The Shelter among them — with 22, and Joseph Max Cohen’s The Clinic with 21, the city’s data show. But there still is a large number of small shops. The remaining Denver pot licenses are scattered among 641 people with ownership interests as little as 1 percent, records show. Many of them — 215 — have an interest in just one license; 175 of them are solo owners. That the industry is becoming slightly top-heavy isn’t surprising, insiders say, mostly because acquiring a license is easy. A handful of the industry’s early leaders are selling and walking off, blaming heavy taxes and regulations. Others say they will grittily fight on. Fox’s 3D Cannabis Center on Brighton Boulevard at best grossed $400,000 in one year as a medical dispensary. In its first year of retail sales, the shop topped $3.5 million. The taxes she owed, however, eventually pushed her to pack it in. She is selling her business. Pot businesses last year filed nearly 450 change-of-ownership applications with the state. Many more have said they would seek out-of-state investors if legislators approve a bill to allow the practice. “The system is not at all set up for the small guy to succeed,” said Michelle Tucker, whose High Street Growers and Back to the Garden shops recently were tagged with a recall over alleged use of unapproved pesticides. The incident has hurt her business.